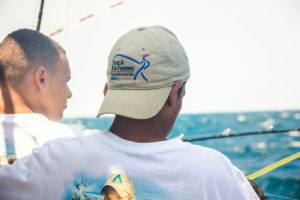 Once a year, the crew at Realty World First Coast Realty teams up with the Take A Kid Fishing Foundation to help bring a new outlook on life to children who otherwise may never get to experience the beauty of the Crystal Coast. Every year, rambunctious groups of children are given a chance to experience fishing along the beautiful waters of the Crystal Coast. For many of these children, getting to the beach is a once in a lifetime opportunity. These children come from all walks of life accross the state. For many, a day spent at the beach is like a holiday, but the same could be said for all involved. Along with volunteers, local businesses take part and come together on this day: The NC Aquarium at PKS, the Beaufort Pier, The Bogue Inlet Pier, The Crystal Coast Lady, The Nancy Lee, The Carolina Princess, The Beaufort Pirate Ship, – all in hopes of creating a one-of-a-kind memory for North Carolina children. 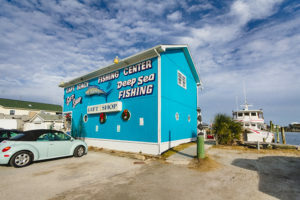 We were lucky enough to spend our day with the experienced team at the Capt’n Stacy Fishing Center, in Atlantic Beach, NC. Many volunteers gathered at the entrance of the dock to greet the children, hand out hats and wristbands, and instruct them on where to go. The children boarded the boat, and for some, this was a first. The sides of the boat were lined with rod holders, anxiously awaiting the first tug of the line and whistle of the spinning reel. The kids sat patiently as the captain gave instructions for the day and what is to be expected. The chaperones, many of whom were just like these kids not too long ago, were donned with smiles. As we departed the dock, the smell of diesel filled the air. The sun sat on the horizon, beautifully lighting the landscape. To our West, we were greeted by the Atlantic Beach bridge, but we were headed East, toward the Beaufort Inlet. Of all the children on the boat, there were two young boys strapped with cameras making their way around the bow of the boat, documenting their friends and the day. Heading through the inlet was a bit rough, and the rolling waves didn’t agree with a few kids. 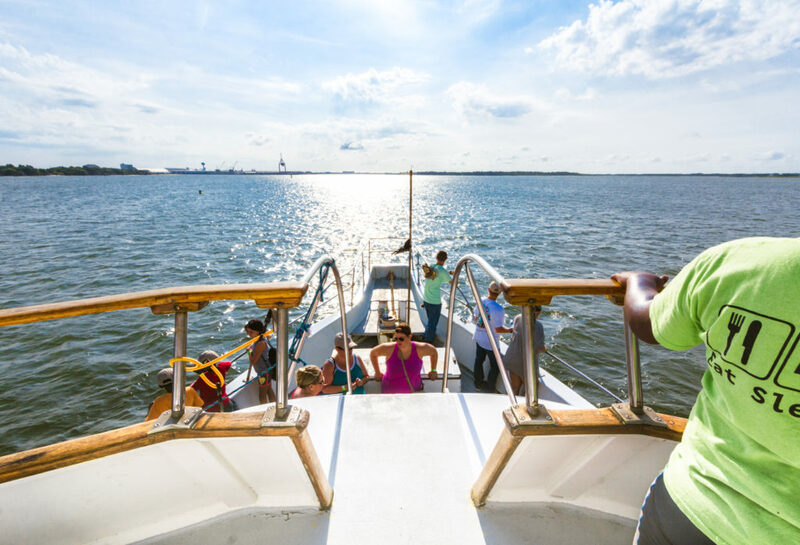 Some of the seasick made their way inside, to the galley, while those who remained outside were privy to passing by the Cape Lookout National Seashore and the iconic lighthouse. The warm air in the morning light portrayed the lighthouse in a grayish haze. 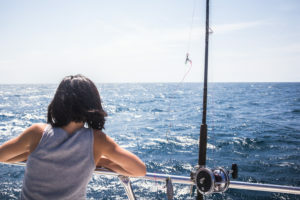 As stories of who would catch the biggest fish, and JAWS began to make their way around the boat, you could feel the excitement building. The mates began making their rounds, lining up the rods and ensuring that each hook had fresh bait, which could have either been squid or fish. The boat rose and fell with the waves, and, like butterflies, schools of flying fish could be seen skirting along the water spray, then ducking effortlessly back into the ocean. Within an hour or so, we found ourselves atop a school of fish. With the captain’s orders, the horn blew and the children swiftly manned their fishing rods. There was so much excitement and anxiousness in the air you could cut it with a filet knife. With a click of the release the lines were spinning and the game was on. Once the lines are in, the kids wait with aniticipation for what they may catch. Within minutes, there were shouts from across the boat, “I got one!”, “I got two!” and “There’s something big down there!”. Volunteers methodically made their way through the canopy of fishing lines to help bring the fish to the boat. Within minutes, there were shouts from accross the boat – “I got one!”, “There’s a big one down there!”. Black sea bass, pinfish, flounder, triggerfish, hogfish, spanish mackerel, amberjack, sharks and even a remora were some of the amazing creatures pulled in. At times, there were even two fish hooked on the same line. The ones that could be kept, were put into a white bucket full of ice, allowing the kids to get a better look. Of course, no fishing trip is complete without encouraging the kids that before letting the fish go, you have to give them a farewell kiss. Inevitably, there was some backlash on that request, but some were brave enough to give it a try. The sun left a warm glow on our faces and the ocean provided us with a refreshing cool breeze. After lunch had been served and fish were caught, the horn blew one last time as a signal to set down the fishing rods and find a comfortable place to relax for the return trip home. Little did the kids know, the ride wasn’t over yet. Coming back, the boat was heading into the swell, as the boat rode out the crest of the wave, it fell through the trough allowing a rush of saltwater to spray over the bow of the boat. It was as much fun as a roller coaster ride. The kids were throwing their hands in the air and shouting as the water sprayed over their heads, completely soaking them from head to toe. Laughing and downright drenched, the kids made their way to their seats. The rods sat quietly in their holders, and the reels, painted with rust, reflected the same fulfilling exhaustion that everyone felt. Riding through the inlet, the mates, once again, began their rounds along the deck of the boat, hosing off the all the remnants of the day, cleaning up unused bait or fish scales, and setting up for the next round of fisherman. 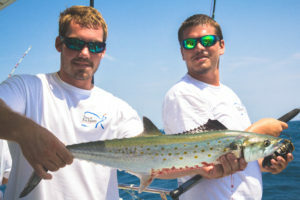 “Bob Hodges was the founder of Take A Kid Fishing and he approached us about the idea. So all the boats, you know, donate either their time or donate a very, very, very reduced rate, just enough to cover the fuel cost and the help. We were the first boat that the foundation started with. Captain Maurice Davis, my brother, was the first one to take kids out on one of our boats after he made arrangements with my dad, Captain Sonny Davis, who owns the company. The second year they had to use the second one of our boats, then the event blew up from there and now they use almost every head boat in the area.” said Loretta Davis Alcrey, manager of the Captain Stacy business, and daughter of Sonny Davis. The Captain Stacy IV, sits and waits for the next round of fisherman to board. 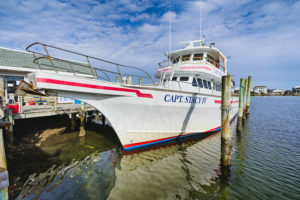 This boat was built by Captain Sonny Davis and is one of the headboats that The Captain Stacy Fishing Center uses.